Every year we celebrate February 14th as the ‘National Organ Donor Day’ – a day to increase awareness about organ donation and the lives that can be saved. Currently, in the United States, more than 120,000 people are waiting for a life-saving organ, most of them for a kidney. National Donor Day focuses on five different types of donations: solid organs like kidney and liver, tissues like intestine and cornea, bone marrow, platelets and blood. Many nonprofit health organizations sponsor blood and marrow drives and organ/tissue sign-ups across the nation. National Organ Donor Day was started in 1998 by the Saturn Corporation and its United Auto Workers partners, with the support of the U.S. Department of Health and Human Services and many nonprofit health organizations and has gained momentum since then. A few years ago, something incredible happened in the state of Kerala. A poor electrician, Gopinathan, developed renal failure and his future appeared bleak without a kidney transplantation. So, his friends initiated a fund collection to ‘buy’ a kidney from a stranger. “Kidney sales,” a term that raises discomfort in everyone’s mind, is all too common in many countries. Remember, this was a time when organ donation and transplantation were still in its infancy in India and the cost for a kidney transplant surgery was exorbitant. 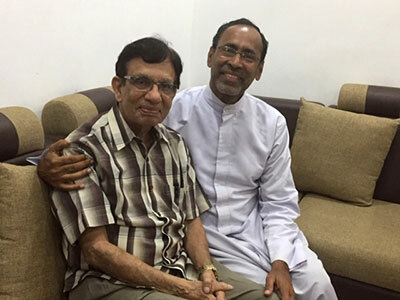 Guess who stepped in to save the life of Gopinathan – a Christian priest, Father Davis Chiramel! And he created history by donating one of his precious kidneys to this poor Hindu patient. As the media put it, “For Fr. Chiramel, this was a natural thing to do — a spiritual opportunity and an act of grace to live the message of Christ.” Extraordinary altruism – giving a kidney to a poor stranger – indeed! On the same day of his donor kidney removal surgery in Lakeshore Hospital, Kochi, Fr. Chiramel, now popularly known as the ‘kidney priest,’ launched the Kidney Federation of India (KFI), a trust to promote kidney donation and raise funds to help patients who cannot afford dialysis or transplants. The trust is working well and already this altruistic trend has caught up with the public, changing the mindset of many previously unwilling citizens who are now coming forward to register as a kidney donor either as a living donor or giving permission to remove their organs after death. During my recent trip to India, I had the good fortune to meet up with Fr. Chiramel and discuss the current issues and public’s acceptance of organ donation and transplantation. Yes, it was indeed enlightening and I could see his passion for this special project. He travels all over the world propagating his message to everybody to become a donor. Later, I gave a talk to the “Urology and Kidney Transplant Division” of Thiruvananthapuram Medical College, my alma mater, at the invitation of Dr. Vasudevan, director of Urology and national transplant coordinator about my experience as a kidney transplant recipient. From the kidney specialists in India, I understood one thing. Kidney failure has become all too common there (in fact all over the world) and dialysis centers are opening up in each district. Living related and unrelated donors are coming forward to donate their kidney to the needy patients as their fear of losing one kidney has abated. And organ transplantation surgery is now available in many tertiary care hospitals and anybody eligible can become a living donor in India and you will be issued a ‘donor card.’ This is indeed a welcome sign.